The next Food4Good fruit & veggie sale is taking place on April 3, 2018. Yellowhead Brewery will be hosting a series of markets this year. The first will be held April 7 and 8, 2018, and will host local artisans. Admission includes a pint of beer. The next Swine and Dine dinner will be hosted at Bundok on April 18, 2018. The 124 Grand Market will debut a second location on Sundays this summer starting May 10. Look fort his market from 11am-3pm on 102 Avenue between 122 and 124 Street. Save the dates for this summer’s What the Truck?! events, taking place May 26, July 6, and August 26, 2018. The city’s bakery numbers continue to increase: Pome Bakery opened up earlier this year at 14253 23 Avenue. Francois Le Roi is a new French chocolatier that has opened in Old Strathcona, at 8116 Gateway Boulevard. Mi’Ne offers Asian rice and noodle bowls alongside steamed buns just off of the U of A campus at 11132 82 Avenue (thanks Su for the heads up!). Sole is a new cafe that just opened at 9911 72 Avenue. Viphalay’s McCauley location has changed hands and is now Noi Thai restaurant. Haus Falkenstein and Salz have been featured in Bite Size videos. Liane highlights some of the spectacular new desserts offered at Cafe Linnea. Liane also profiled Caramunchies, born from one of the women behind the now shuttered Caramia Caramels. Linda shares her love of the croissants at Chocorrant. Twyla did not find Edmonton’s best burger at YEG Burger. Vue Weekly was expecting more from Rebel Food and Drink. Overall, Sharon has enjoyed her multiple visits to Buco. Graham was disappointed with the offerings at Wildflower Grill. Sharman recapped the last Taste Alberta Prairie on the Plate dinner that took place at Chartier. I’m sad to have missed the taping of the Let’s Find Out podcast that was all about green onion cakes, but I’m happy to see that the recording is now live! Interested in the meal kit trend that seems to have swept the nation? Learn more about the business with this Journal piece. Eat North has a new Canadian food podcast that premiered today, featuring Phil (aka Baconhound), alongside Toronto-based writer Emma Waverman. The number of urban hen licenses hasn’t increased significantly since the pilot began back in 2014. 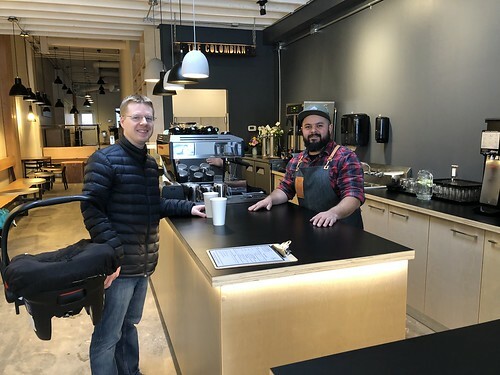 Mack and I visited Colombia Mountain Coffee’s new Glenora cafe location last week – their soft opening continues until April 7 – check them out at 10340 134 Street. It’s been some time since I’ve been to Meat for brunch, but they never disappoint! 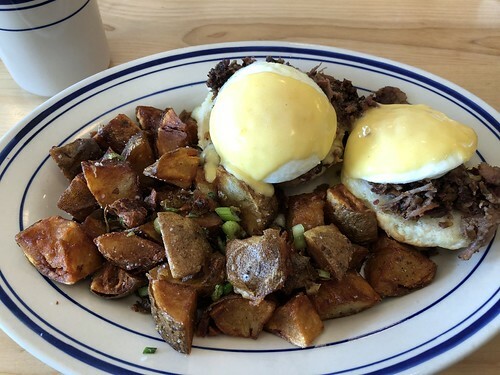 I love the beef brisket benny.